Once again, I have written some short program notes for an Oahu Choral Society concert and I'm posting the notes here. Enjoy, and if happen to live on Oahu, please come to the concert this Saturday, April 22nd, 2017 at 7:30pm at St. Andrew's Cathedral in Honolulu. The definition of “motet” varies widely according to time and place. While the term was originally used in medieval times to describe a piece in which one part sang different words and rhythms than the other three, the genre evolved over centuries, changing form and transitioning from sacred to secular and back to sacred. By the time of Johann Sebastian Bach, motets differed by country (France, Italy, and Germany had their own traditions) and even by Christian denomination within countries. 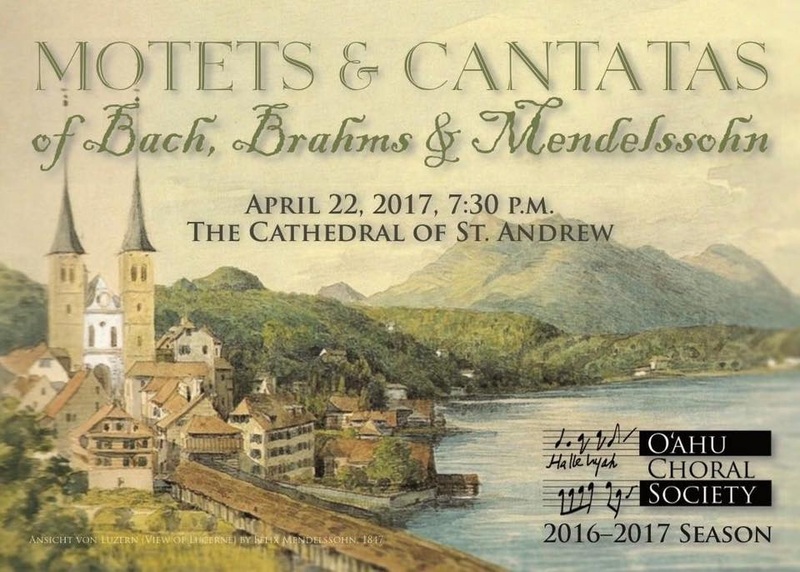 For Bach, the motet was the smaller, less operatic, dying antecedent of the cantata, the genre that occupied a large portion of his output. Like his cantatas, Bach’s motets were self-contained musical sermons featuring both known chorales and biblical quotations, but they were usually written for special occasions outside of regular church services. * Written in this tradition, Jesu, meine Freunde (Jesus, My Joy) alternates between re-harmonized chorale verses and New Testament texts that comment on the preceding chorale texts. Bach sets up an overarching parallel musical structure for the eleven movements in the work, with the form AbCdEfEdCbA (the bold, uppercase letters represent the six chorale verses, which also have parallel harmonizations). F, the center section, is an expansive fugue with its own short chorale postlude. text and was meant to draw a line in listeners’ minds back to Bach’s motets. Zwei Motetten (Two Motets), Opus 29, represents a deliberate attempt to write using Baroque techniques. In the second motet of Opus 29, “Schaffe in mir, Gott, ein rein Herz” (“Create a pure heart within me, O God”), Brahms gave himself very strict compositional restrictions—for instance, in the first section, the top soprano part is exactly the same as the bottom bass part, only twice as fast, and the third section features two outside parts singing a strict canon but offset by one measure and a whole step—but each is so masterfully conceived that this is hard to hear even when the audience knows. The second and fourth sections are more traditional fugues, with Romantic twists. Bach’s cantata Ich will den Kreuzstab gerne tragen (I Will Gladly Carry the Cross) was also a sermon for Sunday service, written for solo baritone and a small ensemble. The text uses sailing imagery to talk about the trials of life and the joy of uniting with Christ in death, probably inspired by the final chorale verse, taken from Johann Franck’s “Du, o schönes Weltgebäude” (1653). Felix Mendelssohn was a key player in the Bach revival of the early nineteenth century, and perhaps Brahms would not have revered Bach so much without Mendelssohn’s promotional efforts. Like Brahms later, Mendelssohn copied aspects of Bach’s music in his compositions, as evidenced by his chorale cantatas, which take as their starting place known chorales: one voice sings the chorale tune, while the other three voices and the string quartet create quick, contrapuntal textures around (and before and after) the slow-moving chorale. Curiously, though called a cantata, this form resembles the original, medieval motet perhaps more than Bach’s motet. In “Jesu, meine Freude” (“Jesus, My Joy”), the chorale is sung in the soprano part; in Wer nur den lieben Gott lässt walten (Whoever Lets Only the Dear God Reign), Mendelssohn expands the formula with simple chorale presentations at the beginning and end of the work and a larger second movement featuring florid counterpoint set around the chorale tune, this time in the bass. Mendelssohn also adds a short soprano aria before the final chorale. Press, accessed April 9, 2017.